Odds are, some of you are over this meditative Advent thing and are ready for some practical *&%$. This is for you. To walk through any kitchen store, one would think you've got to invest $10,000 on ice cream makers, bread machines, and silicone muffin pans. Hogwash. I've always loved the magazine Saveur, especially because they go into home kitchens all over the world and photograph what is there. And often, it's one butane burner on the floor, one seasoned pan, and a wooden spoon. Expensive equipment does not a good cook make. Especially in this season of grabbing giving, I like the reminder that less is more. And less is less, which many of us need. 10 and 12" nonstick skillets. Don't buy expensive ones. The coating won't last longer than a few years no matter how much you pay. I buy mine at Cash and Carry. A cast iron skillet. A really big one if you don't have a cast iron griddle, which I do. One big whisk and one small one. Actually, I have 3 small ones because I use them so much. Again, you don't need this to fly you to the moon. Get them at Cash and Carry or TJ Maxx. Baking sheets, or "jelly roll pans" with sides (not nonstick). My 4 are totally black and marred because I use them for everything. A roll or sheets of parchment paper (Costco or Cash and Carry) so it doesn't matter what your baking sheets look like. They will perform beautifully! A food processor. Bittman doesn't list this as an essential, but I couldn't do without it. A wok (only if it's the cheap carbon steel kind and you commit to seasoning it well and you've got burners that get hot.) Otherwise, use your cast iron skillet. A big pot for soup. Two sizes of saucepans with lids. A glass 9" pie plate, an 8x8 glass or metal pan, and a 9x13 glass or metal pan. Some cheapo muffin and bread tins (not nonstick). Once you grease or line them, it doesn't matter how fancy they are. A cheap box grater and a not-so-cheap Microplane grater. A flexible, metal, very thin spatula for turning eggs, pancakes, and taking cookies off their sheets. None of these chubby silicone ones. I found mine at an estate sale for a dime. 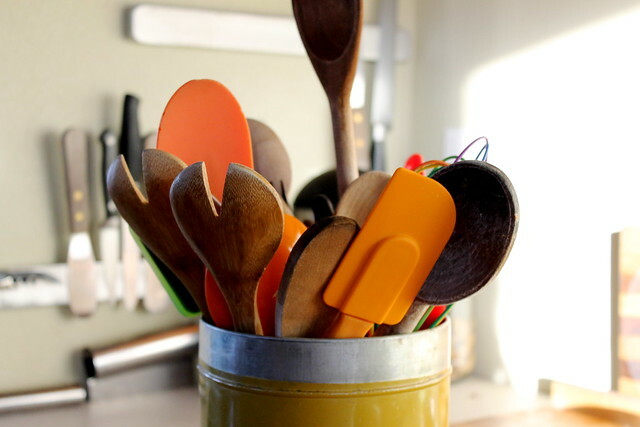 A vegetable peeler, paring knife, chef's knife, bread knife, ladle, silicon spatula for scraping bowls, and tongs. Salad spinner. Some people would put this in the "extras" category. If you eat as many greens as we do, you'd be setting yourself up for emitting many expletives in front of your children. I just had the same one for 15 years and recently got a new one after the plastic bowl cracked. A big colander and a little one (for draining capers or olives, small bit of herbs, etc.). You can blend things in a food processor, but nothing beats a little $30 immersion blender for soups, smoothies, or pureeing a can of tomatoes. I am ridiculous and have a Vitamix. You don't need that. A garlic press. Real cooks decry them, but I'm not down with chopping garlic every time I need it. Bench scraper. I think Rachael Ray calls this a "food mover." I couldn't go 5 minutes without it. Fine mesh sieve for sifting powdered sugar, washing grains, or straining liquids. It was so tempting to leave this list an even "20" but that would be disingenuous. I can't live without a sieve. Again, cheapo at Cash and Carry. You don't need a titanium handle. I hope you're finding some time to spend in your kitchen this month. I'm not making any gingerbread houses (that activity, by the way, has absolutely zero appeal for me--you can't even eat it when you're done! ), but I'm enjoying all the little tasks--washing kale, finding new uses for cranberries, going through the butter like there's no tomorrow. Thanks for being such a wonderful audience.